The Tyvek pouch forming machine- medical pouch forming machine - makes Tyvek pouches up to 13 inches wide - is a semi-automatic horizontal form fill seal style machine that makes Tyvek pouches. 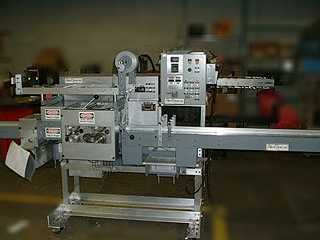 It is a web handling machine with adjustable tooling, to make Tyvek pouches for medical packaging. Continuous operation of pouch manufacturing using rotary motion. Simple pouch size adjustments, ideal for short runs. Machine has web over in-feed conveyor. Can produce 3 sided seal pouches. Besides making pouches, medical products can also be packaged as the pouches are being made. Medical products are placed on moving packaging material (carries product) at a positioning device located on the conveyor. The product is then delivered to sealing area.